Like the 8Bitone synthesizer app, NESynth lets you create 80s-style music with 8-bit sounds. 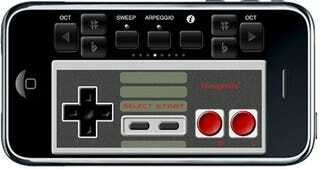 But the coolest part: You can control it all with an on-screen NES-style gamepad. Watch the rockin' video after the jump to see what I mean. Also fun is the $2 app's use of the iPhone's accelerometer to pitch-bend sounds, and its ability to let you jam along with a friend—and hear what they're playing on your phone. As you'll hear in the video below, NESynth has built-in classic sound effects (jump, fire, laser, etc), and an arpeggiator to help build up melodies using the on-screen piano keyboard.